Set consists of 200g Radiant Natural Almond, 200g Radiant Natural Walnut, 200g Radiant Natural Cashew Nut, 200g Radiant Natural Hazelnut and 100g Radiant Organic Brazil Nut. Radiant Natural Almond is a product of USA and contains fat, iron, vitamins, potassium and calcium. 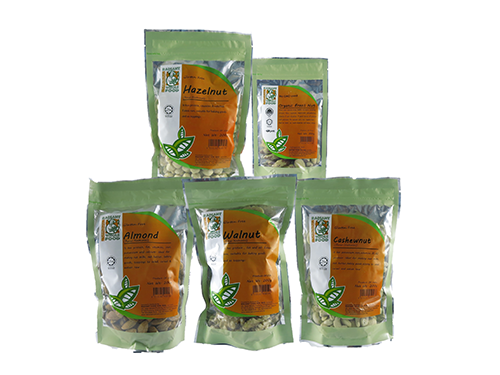 Radiant Natural Cashew Nut contains potassium, iron, Vitamins B1, B2 and protein. Product of India. Radiant Natural Walnut contains protein, oil and fat. Radiant Natural Hazelnut has protein, vitamins and calcium. Radiant Natural Walnut and Radiant Natural Hazelnut are both products of USA and ideal for snacks, making nut milks, nut butter, baking, salad and cereal toppings. Radiant Organic Brazil Nut is high in protein, fibre, selenium, magnesium, phophorous, Vitamin E and Thiamine. Product of Peru.